I have seen plenty of movies over the years that have portrayed the demise of an active alcoholic or addict quite well, but rarely do they ever seem to show the painstaking efforts involved on their journey to get sober or the effects it has upon their family and loved ones. Thankfully though, one recent film titled “Beautiful Boy” actually does just that. 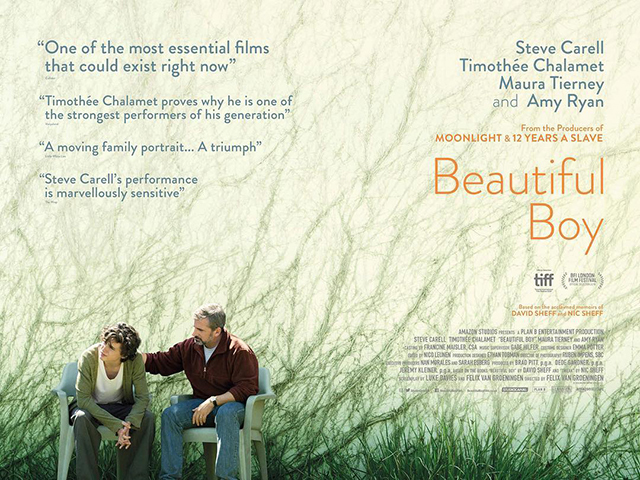 Based upon the true story of David Sheff (played by Steve Carrell) and his son Nic (played by Timothy Chalamet), “Beautiful Boy” tells the heart-aching story of an exceptionally gifted young teenage boy’s rapid descent into drug addiction and the agony it brings not only him, but also his father and family. From one relapse to the next, Nic finds himself in a vicious cycle that always befalls anyone who severely suffers from the deadly grips of drug addiction. Through all his lies and deception, promises that never get kept, a constant emotional instability, and even theft, Nic’s family experiences all too strongly, the sad plight of a drug addict and how powerless they truly are to ultimately stopping it. Yet, in the end, Nic’s story is also an inspiring one, one that finds him eventually discovering the path to recovery, but not before his and his family’s life gets completely unraveled into utter chaos. My heart truly did ache while watching “Beautiful Boy”, mainly because I kept thinking this kid was going to die from this disease, given how low of a success rate there is with those who fall prey to drugs like he did (mainly Crystal Meth), and given the number of sponsees and friends I have personally lost to overdoses. In fact, just over four years ago now, I sponsored someone who was pretty close in age to when Nic was deep in his own drug addiction. Unfortunately, his story didn’t end like Nic’s, as he was one of those who continued to relapse until he eventually overdosed. Sadly, that’s often the case these days with many hard-core drug addicts. Nic was actually one of the lucky ones who somehow survived this disease and is now living to tell his hard-earned road to recovery. I think the hardest part in watching Nic’s story play itself out on the big screen was in seeing how his family tried every possible tactic and level of support, hoping it would bring him into sobriety. But, that’s the biggest misconception that parents and loved ones often have of alcoholics and drug addicts in their lives. They think they can control it or cure it and sometimes are blamed so much so into believing they are the cause, yet none of which are true. The reality is that an addict is the only one at fault for their disease and is the only one who can ever bring themselves into sobriety and recovery. In the end, there is NOTHING anyone else can do to bring that about, no matter how much love, anger, tears, grief, guilt or manipulation gets expressed. That being said, I recently became aware of a family who continues to spend countless money, hours, and anguish trying desperately to get their adult son into a life of recovery, yet in the process have been making themselves grow sick, weary and imbalanced. I only wish they would discover what Nic’s family discovered in “Beautiful Boy”, that being a 12-Step program called Al-Anon, which is specifically tailored for families and loved ones of addicts. In Al-Anon, one can find plenty of help, help in learning to cope with an addict, not help in trying to fix them, which isn’t possible. Thankfully, Nic’s family got that help and hopefully so will this other family as well. Nevertheless, “Beautiful Boy” is an exceptional film that truly chronicles the full spectrum of drug addiction, on both the family and the addict themselves, through all the trials, tribulations, and suffering, to eventual healing and recovery for both. I highly recommend seeing this movie and hope it ends up getting recognized during the upcoming awards season.